For the true fantasy football addicts amongst us, below you will find my “never too early” 2019 tiered rankings for the wide receiver position with accompanying analysis. We already tackled the quarterback and the running back positions. This information is also now actionable, thanks to best ball leagues with drafts taking place already on DRAFT.com and BestBall10s.com. 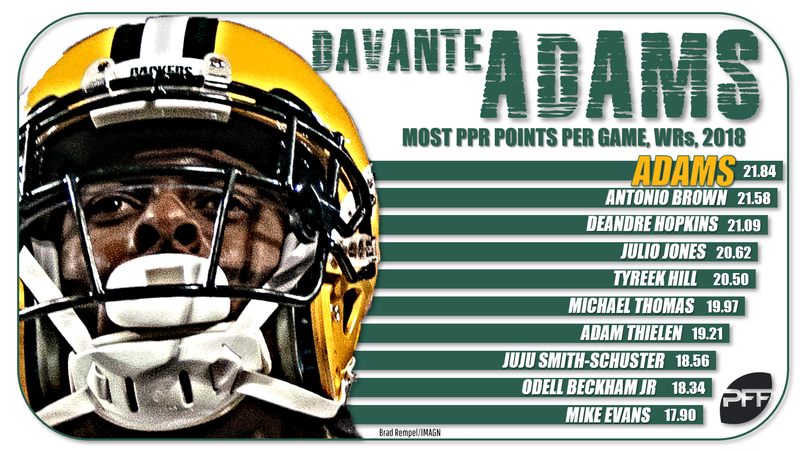 Adams led all wide receivers in fantasy points per game in 2018 (22.0) and showed enough to convince me there’s legitimate cause to draft him as the No. 1 overall wide receiver in 2019. That said, I’d have no qualms with anyone who prioritized Hopkins. I’m not sure volume will be as good for Hopkins next year as it was this year, with the (ideally) healthy returns of Will Fuller and Keke Coutee. However, that should also, hopefully, result in less defensive pressure and improved efficiency for Hopkins. He ran 47% of his routes lined up against top-30-graded cornerbacks in 2018 – only Zay Jones faced more. … Hill nearly led the position in total fantasy points on the back of a historic season from quarterback Patrick Mahomes. He’s now a top-four wide receiver for me in all leagues, and a little more valuable in best-ball leagues (where week-to-week variance is less detrimental and, in his case, a net positive). … For the fourth consecutive season, Jones led the league in yards per route run. Unlike his 2017 season, in 2018 he saw terrific volume (leading the league in targets) and also managed to get over his end zone-phobia. Realistically, it wouldn’t shock me if any of these wide receivers finished the 2019 season as the position’s top fantasy scorer. So, there really isn’t much separating our first two wide receiver tiers. Thomas only ranked ninth in targets, but sixth in fantasy points per game. He also ranked top-three in PFF grade for the second consecutive season, and now ranks third-best all-time in fantasy points scored through a wide receiver’s first three NFL seasons. … I’m hesitant to officially bump Smith-Schuster up to Tier 1 with Brown still technically on the team, and I’m hesitant to bump up Brown without knowing where he lands. In any case, no matter the scenario, I’m confident both will finish as WR1s in 2019. Right now, though, I have a feeling Smith-Schuster finishes the year with more fantasy points. … Beckham has struggled with injuries for two consecutive seasons, and “only” ranked eighth in fantasy points per game (19.2) in 2018. Still, he’s one of the best wide receivers in the game, and I wouldn’t fault anyone who still views him as a borderline-first-round fantasy asset. Across the last three seasons, Evans has ranked 13th, 12th, and 10th in fantasy points per game, but now has to contend with a new offensive play-caller who typically doesn’t feature his WR1. Meanwhile, Allen “only” ranked 18th in fantasy points per game (16.3) in 2018, despite the fact that we should have expected more volume following Hunter Henry‘s year-long absence due to injury. Despite these concerns, both receivers have an extended history of high-end production. … Through the first eight weeks of the season, Thielen ranked first at the position in fantasy points per game (and by a whopping 3.1 more fantasy points per game than the next-closest wide receiver) while Diggs ranked 12th. 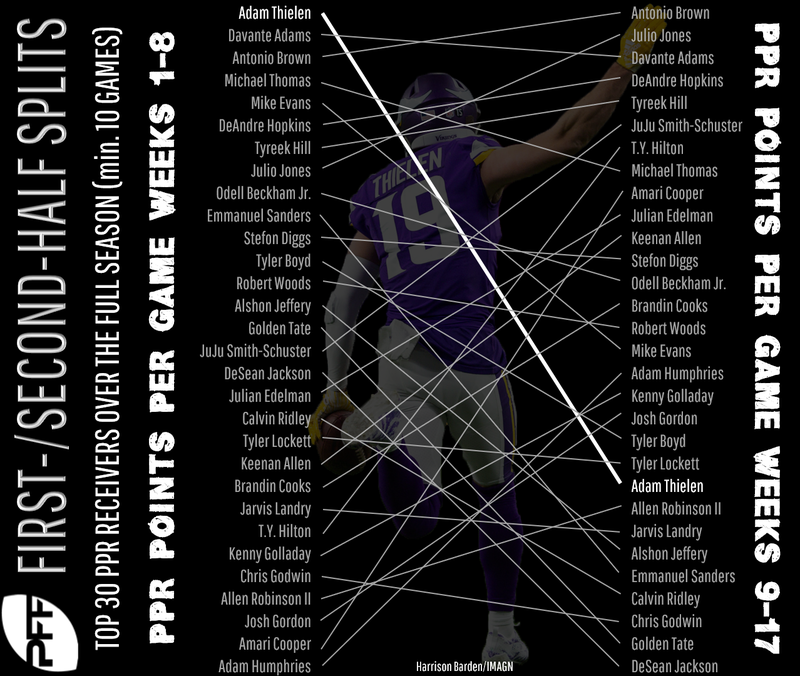 From Weeks 9 through 17, Diggs ranked 12th in fantasy points per game, Thielen 26th. Both should be drafted as (at least) borderline WR1s, and though I think Thielen should rank higher for 2019, it wouldn’t surprise me if Diggs outscored him in 2019. … Across Andrew Luck‘s last three full seasons, Hilton has ranked 11th, seventh, and 13th in fantasy points per game. … Green looks like an easy post-injury value for 2019. Over the last four seasons he’s ranked 12th, fourth, 11th, and 15th in fantasy points per game. … Cooper is probably worth drafting as a Tier 3 wide receiver in best-ball leagues but can be maddening to own in your more typical start/sit leagues. Buoyed by two monster games, Cooper ranked ninth among wide receivers in fantasy points per game after arriving in Dallas. Last season, Woods ranked 11th in fantasy points scored, while Cooks ranked 13th. Kupp actually led the team and ranked 14th overall in fantasy points per game. If only counting weeks all three were active, Woods ranked 11th, Cooks 14th, and Kupp 15th in fantasy points per game. … With Rob Gronkowski looking like a shell of his former self in 2018, Edelman stepped up in a big way. Including the postseason, Edelman averaged 18.3 fantasy points per game since returning from suspension (would have ranked 10th-best), while also reaching at least 16.0 fantasy points in 80% of these games. Unlike someone like Cooper or Hill, Edelman is more valuable in start/sit leagues than best-ball leagues. Assume a massive fall-off from Tier 4 to Tier 5. Landry and Robinson were disappointments relative to their expectations following their respective changes in scenery. I’m expecting more from them in 2019, but still can’t justify valuing them as anything more than a mid-range WR2. … Zach Ertz should continue to be the focal point for the Eagles’ passing attack, but Jeffery feels like a safe bet to put up mid-range to low-end WR2 numbers again in 2019. … Baldwin was never close to 100% at any point this season, and because of that, I’m not entirely willing to embrace Tyler Lockett as the team’s new WR1. Baldwin ranked top-16 in fantasy points per game in each of his previous three seasons. … With Darrell Bevell joining the Lions as OC, expect Detroit to shift gears and become a far more run-heavy offense. Still, Golladay showed enough in his sophomore season for me to view him as the new WR1 on this team. Lockett finished 18th in total fantasy points, and actually just put together the most efficient season we’ve ever recorded from a wide receiver, earning his quarterback a perfect passer rating when targeted (158.3), which is the first time that’s ever been done in the PFF era (min. 15 targets). It’s not how I have it, but I wouldn’t fault anyone for taking him over Baldwin. … Watkins is the No. 3 pass-catcher on what’s probably going to (again) be the best passing offense in football next year. … Davis was a disappointment again in 2019, despite good volume, but also had a brutal cornerback schedule on an anemic passing offense. … Fuller quietly ranks 23rd in fantasy points per game over the past two seasons (even including games where he left early due to injury). The question is, can he finally stay healthy? Moore is an exciting young wide receiver brimming with potential, following an impressive second half in 2018. After two seasons of sub-mediocrity, Boyd took a massive step forward in 2018, though it remains to be seen how much of this was due to Green’s injury. … Jones will likely be a strong post-injury value, even if Golladay out-targets him and Detroit takes a more run-heavy approach. … Fitzgerald is 35 years old and coming off of a career-low in receiving yards, but ranked fifth, seventh, and ninth among wide receivers in fantasy points over the prior three seasons. If new head coach Kliff Kingsbury can turn the Arizona offense around, I’m hopeful Fitzgerald can end his career in a blaze of glory. … I still have a ton of faith in Tate’s talents, as outlined here. … Like Moore, Pettis was encouraging to end the season. Excluding Week 16 (when he exited early due to injury), he averaged 15.5 fantasy points per game across his last five games.